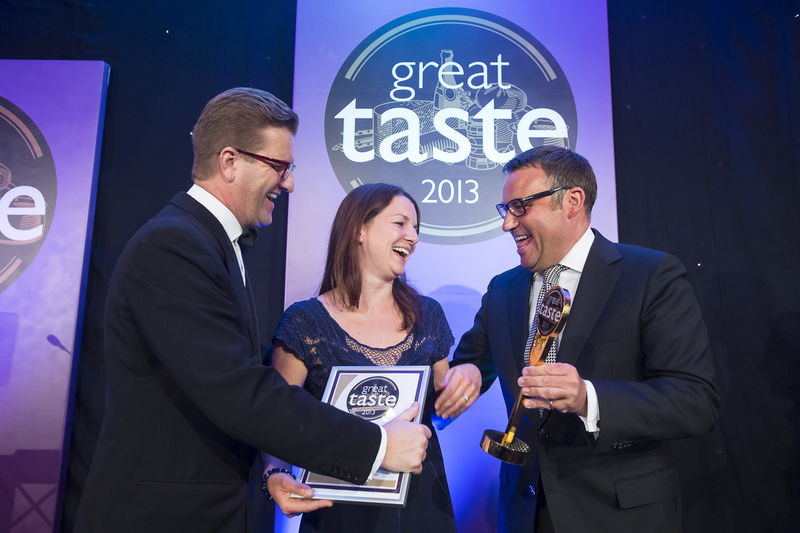 Plain yoghurt made by Marybelle Dairy in Suffolk has been crowned Supreme Champion in Great Taste 2013. The Greek-style yoghurt, made from cows milk, was chosen from 9,738 different entries, including fine food as diverse and characterful as Umami sea salt, Sea Buckthorn & Lime Jam and a Hebridean Seaweed Biscuit. The award, which is sponsored by Harrods, was presented at the Great Taste Golden Fork dinner on Monday 9th September at The Royal Gardens Hotel, Kensington - an event which has hundreds of food producers, speciality food buyers, fine food retailers, chefs and food journalists sitting on the edge of their seat until the Supreme Champion is revealed. To achieve Supreme Champion status, Marybelles 3-star Greek-style natural yoghurt was blind tasted, time and time again by over 30 expert judges who repeatedly picked out the Marybelle yoghurt as exceptional. Fair to say that this yoghurt had our judges in raptures. It is plain and simple, has nothing added and relies 100% on the quality of the milk from which it's made. Our Great Taste judges felt that this incredible dairy product was worthy of the top award and our huge congratulations go the Strachan family and their farm partners for this amazing achievement for the British dairy industry, said John Farrand, MD of The Guild of Fine Food, organisers of Great Taste. Great Taste is all about taste. It is not about packaging or smart design. Judges are simply presented with food or drink to taste and they provide valuable feedback to thousands of producers each year. For a producer to win a Great Taste 1-star award is a great achievement, to win 2-stars means that many judges have been bowled over by the product, and to win a 3-star Great Taste award is comparable to a chef winning a Michelin star. It simply is seen in the world of fine food as a hallmark of taste, quality and excellence. Since 1994, Great Taste has been organised by The Guild of Fine Food and over the last 19 years over 80,000 products have been blind tasted by judges including top restaurateurs, chefs, food critics, fine food retailers, buyers and cookery writers. What do Great Taste judges look for? They look for great texture and appearance. They judge the quality of ingredients and how well the maker has put the food or drink together. But above all, they look for truly great taste. Working in small teams, experts taste 20 foods in each sitting, discussing each product as a coordinating food writer transcribes their comments directly onto the Great Taste website which producers access after judging is completed. Over the years, numerous food businesses, start-ups and well-established producers have been advised how to modify their foods and have subsequently gone on to achieve star status. Any food that a judging team believes is worthy of a star is judged by at least two further teams. Only when there is a consensus will a star be awarded. For 3-stars, judges attending the session, which can be as many as 30 experts must overwhelmingly agree the food delivers that indescribable factor. Marybelle was created out of necessity to preserve a Pedigree herd of Holstein cows, established for over 35 years. In the aftermath of BSE, Foot & Mouth Disease and declining milk prices, a positive move towards a sustainable future had to be made to make the business of dairy farming profitable. With a main purpose of preserving and caring for a herd of 200 cows, Marybelle was established and the new business was named after two of the most influential milk-providers to Marybelle - Telstar Mary (a Holstein) who mothered many calves during her lifetime and over 30% of the cows at Marybelle are decedents of Mary. Duncan Belle lives in Canada and was voted Cow of the Millennium for her achievements in milk production and her ability to transmit her potential to offspring. Belle is the foundation cow to the Jerseys at Marybelle and over 50% of the Jerseys in the new herd are related to this great cow. Four Suffolk farms currently supply milk to the Marybelle Dairy including the Strachan family of Rendham Hall Farm in Rendham who founded Marybelle, the Walker family at Low Farm Sotherton, the Burroughs family at Wheatacre Hall Farm at Beccles and the Crickmore family at Fern Farm near Bungay.